Software-as-a-service refers to the concept of a hosted solution. The vendor (Salesforce in this case), owns and maintains the servers, software, and everything else that is required to keep the system up and running. The customer purchases licenses to use the product, and connects to the software through the internet. 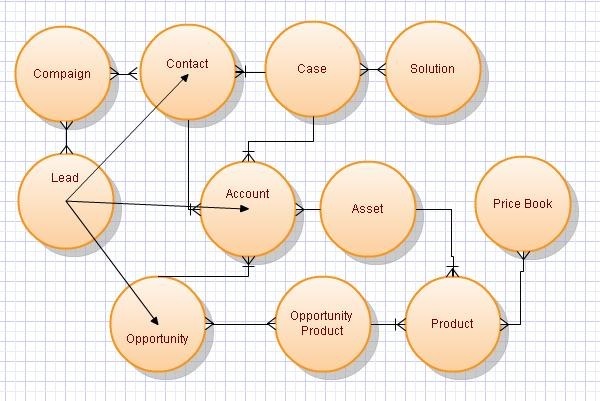 The beauty of this model is that the customer no longer has to maintain the IT infrastructure. The downside is that it can be more expensive long-term than the client/server model, and requires a constant internet connection. You should also become familiar with the term platform-as-a-service (PaaS). This refers to the end-to-end development and release of an application through the web. For instance, I would design a custom app for Salesforce.com and release it to my users entirely through my web browser. Both SaaS and PaaS are examples of cloud computing. The gist of cloud computing is that the server(s) is hosted on the internet (also known as the cloud). Salesforce applications are a bundle of tabs packaged together. When you change applications it will changes the tabs listed on the top of your screen. Each tab represents a Salesforce object. Below is an overview of the applications and the tabs packaged by default. The help & support section of Salesforce does an excellent job of explaining what each of these objects does. The bulk of understanding how each object relates to the whole application comes mostly through experience. Accounts are where the company contact info is stored. Understand the Person Account- this type of account combines the contact and account into one object type. This would be used for b2c applications where two records would be redundant. Person Accounts must be specifically requested and can only be enabled by Salesforce.com staff. Activities are split into tasks and events. Tasks are typically phone call or emails that would be logged on the account/lead/opportunity/case. Note that the look-up field field on activity is not standard because it can reference many different objects (more on this later). Events are appointments; think calendar items in Outlook. Activities are enabled on a per-object basis. This means that while you log calls on an account you cannot log a call on a report, for instance. Assets can be used to track your company’s or your clients’ assets. They relate to the account and contact, and link to Products, by default. Products do not need to be added to a price book to be linked to an asset. Campaigns are used for marketing purposes. Leads and contacts can be added to a marketing campaign. The campaign can then be used to track response rates to marketing campaign, establish ROI, and so forth. Web-to-lead can be configured to automatically add your lead to one campaign. Cases are used to track support issues. They can be configured to be accessible through the self-service portal (Salesforce.com support is set up this way). Email-to-case and web-to-case are also possible. Contacts store contact information, and are linked to accounts. If a contact is not linked to an account then it is a â€œprivateâ€ contact and only viewable by the contact owner or salesforce administrator. Contracts used to track contractual agreements and provide an audit history of that agreement. Contracts are related to accounts, not opportunities. Dashboards are comprised of components. Each component links to a report or external source. Each report can provide only one summary field (two for matrix reports). The component determines how the data of the report is presented. Dashboards are only as current as the last time they were refreshed. A dashboard refresh can be done manually, or can be scheduled on a daily/weekly/monthly and emailed upon automated refresh. Documents are different than files attached to objects. Documents are shared online documents and are used this is where you would store graphics for email templates and other files that Salesforce uses. Forecasts can be used to project revenue, and track user quotas. Customizable forecasting can be used for users to override projections in opportunities. Leads can be converted to a contact, account, and opportunity. Web-to-lead will allow you to convert website submissions directly into Salesforce leads. Opportunities represent a)a sale or b)a lost sale or c)the potential for a sale. The stage field of the opportunity indicates at what point in the sales cycle the opportunity currently resides, and marks the probability (%) field with the corresponding percentage. This probability field is often used to create projections. Each stage can be marked as Closed/Won (sold) or Closed/Lost (lost) or neither (open); abc respectively. master/detail relationship. Products must be added to a price book to be selectable as an opportunity product. Price Books are used to establish different pricing structures for products. Large client A gets the product for $50, while the public list price is $100. No problem- create the price book "Large client A" and add the product to that price book for $50; add the product to the "Standard Price Book" for $100. Products would typically be used to store the products that your company sells, or the assets that your company or clients maintain. Add products to price books to establish pricing for opportunity products. Reports come in 3 varieties: Tabular, Summary, and Matrix. Tabular is a plain list (like an Excel file). Summary will summarize information on one axis- for instance I want to see all opportunities per sales rep. Matrix reports will summarize information by both axises. I find Matrix reports particularly useful for Dashboard purposes. A report is created by selecting a Report Type. Report Types can be created as well. Solutions are used to create answers to commonly created cases. Solutions can must be reviewed before published, and can be made accessible in the self-service portal creating a knowledge base type of application. Users are the ones that log into Salesforce.com. When a user is no longer "active" you can no longer assign records to that user. Here’s how most of the objects relate. >| means that this is a many-to-x relationship, while a straight line indicates a one-to-x relationship. Example: A contact can be associated with only one account, but an account can have many contacts. Many contact can in turn be associated with many campaigns (many to many relationship).